I’m not Italian so don’t yell at me about being authentic. This is an easy version of a fantastic classic that I’ve made up by taste, not by national pride. 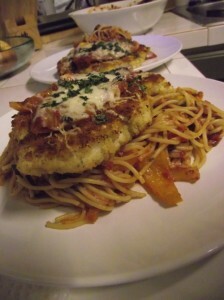 Just because I’m not Italian doesn’t mean I can’t make a pretty damn wicked version of Chicken Parmesan. Pound out 2 chicken breasts until relatively flat but not so thin that it’s tearing. Heat oil in large pan and set up breading station (plate of flour, dish of beaten egg, plate of bread crumbs). Season bread crumbs with garlic powder, oregano and half of chopped parsley. Dredge chicken through flour, coat with egg and then cover well with seasoned bread crumbs. Fry over med heat until cooked through. Place chicken on a foil lined baking sheet, top with good dollop of tomato sauce and Parmesan cheese and broil for a minutes or so until cheese is melted. Garnish with remaining parsley.